Dr. Joseph Kappes is board certified in medical acupuncture. He has had extensive post doctoral training both in the US and in the Orient. He has studied with the best around the world so that he can offer his patients the best care. Acupuncture, simply stated, is a health science which is used to successfully treat both pain and dysfunction in the body. Acupuncture has its roots deeply planted in China. In fact, authorities agree the science is between 5,000 and 7,000 years old. Its use spread throughout ancient Egypt, the Middle East, the Roman Empire and later into Western Europe as merchants and missionaries to China told of the amazing discoveries the people of the Orient had developed. Acupuncture did not become known on a national level in the U.S. until 1971 when diplomatic relations between China and America were relaxed. At first glimpse, Acupuncture appears strange, as its primary notoriety is the utilization of needles placed in the skin at various locations to relieve pain or affect a body part. Early Chinese physicians discovered there is an energy network traversing just below the surface of the skin which communicates from the exterior to the internal organs and structures at over 1,000 "Acupoints" on the body. This energy works in harmony with the body's circulatory, nervous, muscular, digestive, genitourinary and all other systems of the body. When this vital energy becomes blocked or weakened, an effect in a body system or anatomic location becomes evident. Stimulation of one or a combination of key "Acupoints" on the body may restore harmony to the affected area. Historians have stated, "More people have benefited from Acupuncture over the course of fifty centuries than the combined total of all other healing sciences, both ancient and modern"
Meridian therapy is the accepted name employed by those who practice the principle of Acupuncture without the use of a penetrating needle. Acupuncture is a principle, not a technique. Therefore, there are many ways to stimulate an Acupoint other than a needle, just as there are many different strokes used in swimming. 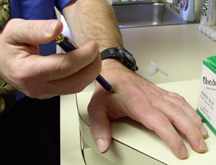 Many practitioners use electronic stimulation, laser beam or pressure massage to treat an Acupoint The principle of Acupuncture does not change, only the technique. How does it work? Far too often in the medical professions, a patient is told after extensive examination, "There is nothing wrong," "It is all in your head," or "Sorry, you'll have to learn to live with it." The examining doctor unable to find the cause of the problem has little else to tell the patient Fortunately, many physicians are now referring their patients for an Acupuncture evaluation as a last resort The human body's energy flow courses over twelve meridians or channels that are normally well balanced. If a disruption of energy flow exists, it can alter the entire system, producing pain or symptoms in the body. If we were to compare a 175 pound man on one end of a seesaw and a 45 pound child on the other end, it becomes obvious the seesaw would be "broken" due to the fact the heavier person would be sitting on the ground and the lighter would be dangling in the air. Even though the seesaw is producing a symptom of being broken--extensive examination would not reveal anything wrong with the seesaw. The obvious answer is in the balance. Correction of the balance corrects the problem. This is Acupuncture's goal-to restore normalcy to the body's energy balance by utilizing a combination of Acupoints located on the twelve meridians. This is accomplished by a variety of means, the needle is just one. Medical research continues in this country and others to attempt to explain in western scientific terms what the ancient Chinese seventy centuries earlier described. Today, many theories have been postulated as to why Acupuncture is so effective in pain control. However, as more discoveries are made, more research is indicated. 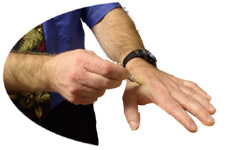 One would assume inserting a needle into the skin would be painful since most of us can relate to being stuck with a pin or having a hypodermic injection. 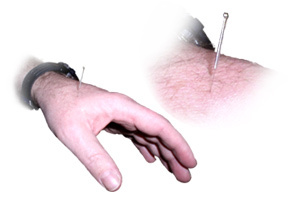 However, four Acupuncture needles can easily be inserted into the hollow tube of a hypodermic needle. Because of the extreme slenderness of the needle, most people compare the sensations "less than a mosquito bite." A phenomena referred to as "TEHCHI" occurs when the energy is contacted. This sensation is felt as a mild to moderate heaviness or tingling. Needles obviously still have their place in clinical practice. However, many physicians certified in Acupuncture and licensed Acupuncturists are employing electronic and laser stimulation to the Acupoint with equal effectiveness as the needle. Both of these procedures are painless and are quickly becoming standard worldwide. The tapping needle "teishein: is not really a needle as it does not pierce the skin. It produces a mild to moderate sensation. Compare it to tapping a ball point pen on the skin. 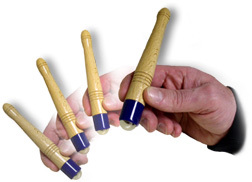 This form of stimulation has been used successfully for centuries. Thumb pressure is equally impressive and not considered painful. Obviously the number of treatments vary with different conditions and individuals. Chronic problems generally require more treatment than acute ones. Some patients notice an immediate improvement after the first treatment, whereas others may not notice any effect until the seventh or eighth visit It's been shown that a certain percentage of patients receive maximum benefit up to three months following a course of therapy. A small number of patients will experience a worsening of symptoms, as the body's energies are returning to normal. This is usual and no need for alarm. It is followed by improvement Researchers internationally agree the usual number of treatments is between eight and sixteen. The usual frequency is between two and four times a week. Patients are urged not to enter an Acupuncture program with the thought of "taking a few" to see what will happen. Even though it is possible to achieve success, a program of ten visits would have a better chance for success. Patients are encouraged to be patient with the healing process. If the treatments are recommended and results occur in just five visits, the doctor may elect to discontinue treatments or continue their use to stabilize the condition. Many critics of Acupuncture have suggested the science is hypnosis or "mind over matter". This criticism is totally unfounded as Acupuncture has startling effects in infants and toddlers as well as veterinary applications. The effected it has in surgery as an anesthetic further disclaims the skeptics. 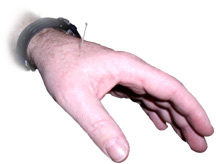 Even total disbelievers report favorable response to Acupuncture. However, a positive outlook is obviously beneficial in all phases of life to include healing. Acupuncture textbooks list well over one hundred different conditions that respond well to Acupuncture. The World Health Organization, working in close harmony with the International Acupuncture training center of the Shanghai College of Traditional Chinese Medicine, has indicated Acupuncture is effective in the following conditions. Acute and chronic pain relief, migraine, tension cluster and sinus headaches, trigeminal neuralgia, bladder dysfunction, bed wetting, cervical (neck) pain, and mid-back pain, low shoulder, tennis elbow, post-operative pain relief, gastric problems, asthma, allergies, skin conditions, hemorrhoids, abnormal blood pressure, fatigue, anxiety, neurologic syndrome, various eye problems, etc. This is only a partial list of the numerous conditions Acupuncture has been credited with helping. The cost of Acupuncture treatment varies in different parts of the country. However, the average appears to be between $45.00 and $85.00 per treatment. Acupuncture has been used quite successfully in place of chemical anesthesia for a variety of surgeries within the last twenty years. At the Beijing Obstetrics and Gynecology hospital it is used routinely on all cases of Cesarean section. At the Long Hua Hospital in Shanghai it's used routinely on cases of thyroidectomy. It has been shown effective in gastric surgeries and brain operations. During the procedure the patient remains alert communicating with the surgeon. The patient does not feel pain, only any pulling, tugging, etc. that may be employed in surgery. It is unlikely that Acupuncture will replace chemical anesthesia in the U.S. However, it is a favorable possibility for those patients unable to tolerate regular anesthesia. The application in dentistry are extremely significant The first U.S. national media coverage concerning Acupuncture was in 1971 during President Nixon's visit to China. There, visiting columnist James Reston told of his emergency appendectomy performed under Acupuncture anesthesia.